Preprints (earlier versions) of this paper are available at http://preprints.jmir.org/preprint/6889, first published Oct 26, 2016. Background: With rapidly expanding infrastructure in China, mobile technology has been deemed to have the potential to revolutionize health care delivery. There is particular promise for mobile health (mHealth) to positively influence health system reform and confront the new challenges of chronic diseases. Objective: The aim of this study was to systematically review existing mHealth initiatives in China, characterize them, and examine the extent to which mHealth contributes toward the health system strengthening in China. Furthermore, we also aimed to identify gaps in mHealth development and evaluation. Methods: We systematically reviewed the literature from English and Chinese electronic database and trial registries, including PubMed, EMBASE, Cochrane, China National Knowledge of Infrastructure (CNKI), and World Health Organization (WHO) International Clinical Trials Registry Platform. We used the English keywords of mHealth, eHealth, telemedicine, telehealth, mobile phone, cell phone, text messaging, and China, as well as their corresponding Chinese keywords. All articles using mobile technology for health care management were included in the study. Results: A total of 1704 articles were found using the search terms, and eventually 72 were included. Overall, few high quality interventions were identified. Most interventions were found to be insufficient in scope, and their evaluation was of inadequate rigor to generate scalable solutions and provide reliable evidence of effectiveness. Most interventions focused on text messaging for consumer education and behavior change. There were a limited number of interventions that addressed health information management, health workforce issues, use of medicines and technologies, or leadership and governance from a health system perspective. Conclusions: We provide four recommendations for future mHealth interventions in China that include the need for the development, evaluation and trials examining integrated mHealth interventions to guide the development of future mHealth interventions, target disadvantaged populations with mHealth interventions, and generate appropriate evidence for scalable and sustainable models of care. In the last decade, China has undergone a continuing epidemiological transformation from infectious diseases to chronic and noncommunicable diseases (NCDs) [1,2]. NCDs caused over 80% of China’s total disability-adjusted life years in 2013 and accounted for China’s largest burden of disease . Chronic and NCDs pose special challenges to existing health systems as the long-term ongoing management of such conditions requires a shift from institutional care to community-based care, with an increased focus on self-management with or without peer or family support . Despite the four major rounds of health care reforms since mid-1980s in China, many health equity and system level challenges remain [4,5]. Responding to those challenges, the health system needs to be adjusted to provide more effective solutions. The portability and connectivity of mobile health (mHealth) can potentially serve as an effective tool in facilitating this adjustment and to allow the health care delivery to reach hard-to-reach population. mHealth has been variably defined. The World Health Organization (WHO) definition is medical and public health practice supported by mobile devices, such as mobile phones, personal digital assistants (PDAs), and other wireless devices . mHealth involves the use of a wide range of functionalities incorporated by such mobile devices, including standard voice, short message service (SMS), Web browsing, and applications on different operating systems. The unprecedented uptake of mobile phones with an ever growing telecommunications infrastructure has driven the development of mHealth innovation around the globe. In China, mobile phone penetration reached 94.5 per 100 people in 2014 . Cellular signals now cover almost all residential areas from densely populated cities to remote villages, with increasing penetration of 3G and 4G networks. Penetration of smartphones has also increased rapidly, reaching 90% in urban areas and 32% in rural areas in 2015 . The rapid development of this mobile infrastructure has created significant potential for mHealth interventions in China. The rapid adoption of mobile phones may be explained by the diffusion of innovation theory, which is one of the most popular theories for studying adoption of information technologies and understanding how information technology innovations spread within and between communities . Although there were several reviews documenting the mHealth interventions in low- and middle-income countries (LMICs) [10-12], no systematic reviews of the scope and value of mHealth initiatives in the largest developing country exist. The specific aims of this systematic review were to (1) characterize mHealth interventions across all disease areas in China, (2) evaluate the extent to which mHealth interventions focus on health system strengthening, and (3) identify gaps in mHealth intervention development and evaluation that need to be addressed in the future. A systematic search of the literature in both Chinese and English published from May 26, 2008 to December 17, 2015, was performed following Preferred Reporting Items for Systematic Reviews and Meta-Analyses (PRISMA) guidelines  using the following electronic databases: PubMed, EMBASE, Cochrane, and China National Knowledge of Infrastructure (CNKI). We also searched for registered trials in the WHO International Clinical Trials Registry Platform, which included 15 approved trial registries and supplementary searches in Chinese Clinical Trial Registry (CHICTR), and Clinicaltrials.gov. English keywords used in these searches included the following: mHealth, eHealth, telemedicine, telehealth, mobile phone, cell phone, text messaging, and China. The Chinese keywords used include “ShouJi” (mobile phone or cell phone), “DuanXin” (text messaging), “YiDongJiangKang” (mHealth), and “Yi Dong Yi Liao” (mobile medicine). Multimedia Appendix 1 lists the detailed search strategy for each database. We included all articles related to health care management using mobile technology in China. Any type of the following articles with full texts was included: (1) randomized controlled trials (RCTs), (2) quasi-experimental studies, (3) descriptive studies without any outcome measured, or (4) registered RCTs. We only included studies written in English or Chinese, and articles related to telemedicine or telehealth were only included if mobile technologies were used as part of the intervention. We excluded all articles describing technology development, review articles, protocol papers, and any studies using fixed landline phone or the Internet using a desktop computer as part of the intervention. A total of 5 reviewers independently evaluated and excluded articles at the abstract review stage. Full-text articles whose abstracts met the inclusion criteria were then reviewed by 3 reviewers. We utilized an adapted health system framework to evaluate the role of mHealth interventions as a health system strengthening tool (Figure 1) [14-16]. In this framework, there were two dimensions: (1) the function of mHealth intervention categorizing into one of the 12 mHealth tools proposed by Labrique et al , and (2) the corresponded health system frame work as developed by Hsiao and WHO [15,16]. Assessing both dimensions of the mHealth intervention allowed us to identify where the gaps were in the mHealth interventions from a health systems perspective. Figure 1. Adapted health system framework for evaluating mHealth interventions. A spreadsheet was developed for entering extracted data that included study characteristics, the mHealth domain, and the health system domain using the aforementioned analytical framework . An agreement was reached on the definitions and interpretation of each variable in the data extraction template among the reviewers before data collection. Three reviewers independently extracted the data into the template and cross-reviewed. Disagreements in this step were resolved by consensus. For RCTs, methodological quality was assessed using the Cochrane Risk of Bias Assessment Tool . We assessed the random sequence generation, allocation concealment, blinding of participants, personnel and outcome assessors, incomplete outcome data, selective outcome reporting, and other sources of bias. Any discrepancies in article inclusion, data extraction, and bias assessment were discussed and resolved by team consensus. We retrieved 1704 articles using the search terms, and 323 articles were selected for full-text review (Figure 2). Of those, 251 studies were excluded for the following reasons: not conducted in China (n=81), not using the mobile technology (n=142), protocol papers (n=6), and review articles (n=22). The study characteristics, mHealth domain, and health system domain of the nonprotocol articles (n=49) are summarized in Table 1. The majority of the studies were conducted in an urban setting (n=34) [18-51], with only 6 focusing on a rural population [28,51-55]. The most common disease focus was on NCDs (n=15) [22,25,26,29,30,34,37-39,42,45,46,52,56,57], whereas 12 studies focused on infectious diseases [33,41,51,53,54,58-64] and 8 studies were designed for maternal and child health [36,40,43,47-49,55,65]. A wide range of study designs was used to evaluate or describe the mHealth intervention, including 18 exploratory studies that described, validated, or pilot-tested mHealth interventions without any quantitative outcome assessment [18-28,58-62,64,66]. A total of 31 studies quantitatively evaluated the mHealth intervention [29-57,63,65], of which 19 utilized a RCT design [29-35,38-40,43,47,51-53,56,57,63,65] whereas the remainder used a quasi-experimental study design (n=12). In most cases, the primary mobile technology was a regular mobile phone (n=36) [18,19,21,25,29-49,51,53-57,59,62-65]. Only 12 studies utilized smartphone technology for the intervention [20,22-24,26-28,50,52,58,61,66]. Table 1. Study characteristics, mHealth domain, and health system domain of nonprotocol articles. The search of registered clinical trials identified 23 additional mHealth registered RCTs (Multimedia Appendix 2). Although 12 of these studies were listed as completed, we were only able to find 5 studies with published results. All 5 studies were identified during the original systematic review of the literature [29,32,51,52,65]. Consistent with the published RCTs, the majority of the interventions described in the registry focused on client education and behavior change using simple text messaging. Applying the adapted health system framework (Table 2), we found the client education and behavioral change communication was the most commonly targeted mHealth domain (n=32) [18,19,21,25,29-49,51,54-57,63,65]. It was found that 5 interventions addressed sensors and point-of-care diagnostics [22,24,26,50,66], 5 interventions focused on data collection and reporting [23,27,28,60,61], 3 interventions involved registries and vital events tracking [59,62,64], 2 interventions focused on electronic decision support [52,58], 1 intervention involved electronic health records , and 1 intervention delivered provider training and education . There were no interventions identified in the domains of provider to provider training, provider work planning and scheduling, human resources management, supply chain management, or financial transactions and incentives. From a health systems perspective, most studies targeted service delivery (n=38) [18,19,21,23-26,29-52,54-57,63,65,66]. Few interventions focused on the provision or management of information (n=2) [60,61], health workforce support (n=1) , medicines and technologies (n=3) [22,27,28], or leadership and governance (n=5) [20,58,59,62,64]. For the RCTs, risk of bias was mostly classified as either low or unclear (Table 3). Four studies did not provide sufficient information to assess risk [34,35,43,47]. Table 2. Health system framework assessment of the mHealth interventions. Table 3. Risk of bias assessment for randomized controlled trials. In this study, we reviewed studies and registered trials for studies published in the peer-reviewed journals involving mHealth interventions in China. We particularly focused on the extent to which mHealth interventions had the capacity to contribute to health care strengthening in the context of a rapidly evolving disease burden. Although we did observe an increasing focus on NCDs, there was little evidence of the development of mHealth interventions that were likely to substantially strengthen health care systems. We also noted a large disparity in the development of mHealth interventions that were focused on rural as opposed to urban areas. In addition, the quality of evidence provided in relation to effectiveness of such interventions is generally poor. Beratarrechea et al  conducted a review to examine the role of mHealth intervention on the management of NCDs in LMICs, with a focus on the use of SMS and automated voice interventions. The study found that there were significant improvement on certain clinical outcomes and processes of care. Peiris et al further performed a review to explore the impact of all mHealth interventions on health care quality for NCDs in LMICs. Similar to our findings, there were few high-quality studies, and most of the studies used the SMS for patient behavior change. Very few studies addressed the mHealth intervention as a health system strengthening tool. On the basis of the literature we have identified, the development of mHealth interventions by academia in China remains relatively under-developed, in terms of both scope and capability. Interventions mostly utilized a texting tool to provide client education and behavior change. 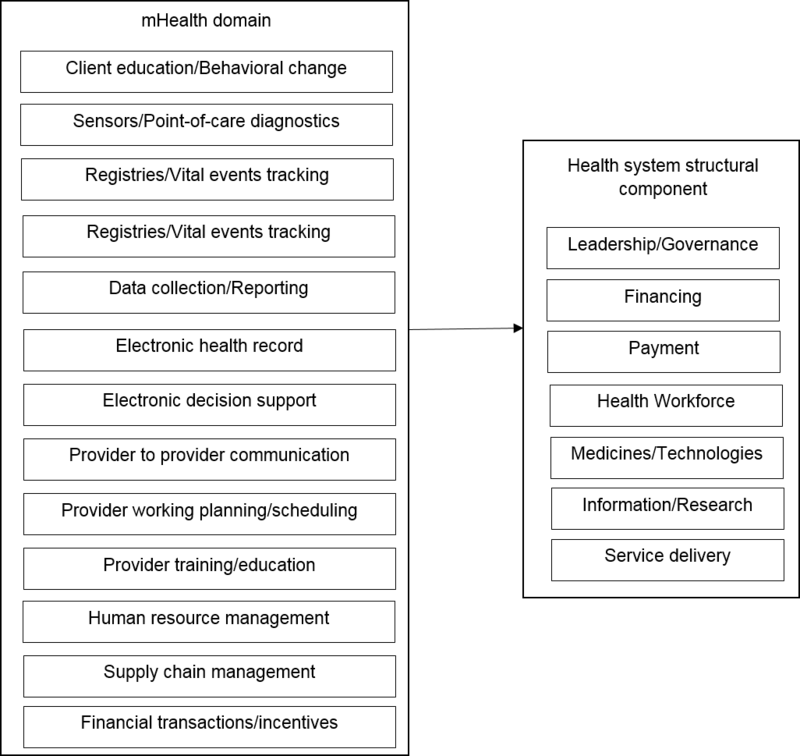 We identified a focus on only 7 of the 12 mHealth domains, with no interventions concentrating on interprovider communication or health service management, including financial transactions. In addition, all the interventions were developed as stand-alone tools to deliver health services, with little or no exploration of how integration within existing or developing health systems can be achieved. Equitable access to quality health services is an important dimension of an effective health system. In China, around 50% of the population is based in rural regions, where health outcomes are, in general, poorer than those among urban communities. Addressing such inequities is a public health priority, and mHealth strategies may provide a particular opportunity to reduce gaps that relate to weaker health systems. As China’s mobile network reaches far and deep into its rural areas, mHealth solutions provide a real opportunity to strengthen rural health systems. Despite the huge potentials of mHealth help in closing the health equity gap, few academic studies in China has chosen to focus on this area. The regional imbalance identified in this review may be explained by the greater convenience of conducting studies in urban communities. However, the potential for mHealth to impact on health outcome inequities cannot be addressed if the digital gulf between those who have access to mobile technology in urban areas and those who do not have access in rural areas is not reduced. Similar considerations are relevant to other disadvantaged subgroups of population, including those with relatively low literacy or socioeconomic status. A key objective of mHealth research should be to provide useful and reliable evidence for end users, including policy-makers in the context of those innovations aimed at improving health outcomes through deployment in the public health care system. Our review found that published and planned mHealth studies in China largely have not and will not produce such outcomes. Fewer than 40% of the published studies utilized an RCT design and all were of uncertain or poor quality based on objective measures. The majority of the reports were descriptive, with no apparent attempt to determine efficacy or effectiveness. Study outcomes were largely the product of low-quality and small-scale experiments, which provided little understanding of the true impact of an intervention with large-scale real-world implementation within complex health systems. There are several limitations to this review. Firstly, we were not able to conduct a quantitative meta-analysis of the outcomes due to the heterogeneity of the RCTs. We identified a number of ongoing trials from the trial registry. The published results of those trials will enable to provide increased power to determine the size of the effect of mHealth interventions on health outcomes. Second, although the adapted health system framework was useful to evaluate the mHealth intervention as a health system strengthening tool, a single study may address multiple mHealth domains or health system domains. We only reported the primary functionality of the mHealth intervention and the key aspect that the intervention addressed in the health system. Finally, this review mainly targeted academic studies in the literature. We should note that China is experiencing rapid development in mHealth technology in the commercial world, many of which may have health system implications that we had limited ability to evaluate in this review. mHealth has the potential to overcome some of the challenges due to the rapid changing environment of health care needs and provision in China. However, this potential can only be realized through the continual development of mHealth interventions to strengthen the health system, utilizing a subsequent rigorous approach to generating high-quality evidence about the likely implications of “real world implementation.” Therefore, we outline three recommendations for future mHealth research and development in China: (1) mHealth studies should not be conducted as the standalone technical study evaluating its efficacy in the vacuum of the social context, (2) promote the development of integrated mHealth interventions as a tool to serve the existing health system, (3) focus on developing and evaluating mHealth interventions with the potential to reduce health outcome disparities within the population, and (4) conduct large-scale rigorously designed “real world” evaluation of mHealth interventions focused on health system strengthening. Specific public and private investment into such research is a priority. We thank the support from Dr Puhong Zhang, the Acting Director of the China Center for mHealth Innovation, and the funding support from Qualcomm Wireless Reach. Detailed search strategy for each database used. Table: Registered randomized controlled trials in clinical trials database. Everett R. Diffusion of Innovations, 5th Edition. New York: Free Press; Aug 16, 2003. Yin L, Liu P, Meng Y, Guan B, Hu B, Chen S, et al. [Xue Ye Jing Hua Zhong Xin Yi Huan Zi Xun Sui Fang Hu Dong Ping Tai Zai Lin Chuang De Ying Yong]. Xian Dai Yu Fang Yi Xue 2009;36(4):781-782. Yang L, Wang X, Liu X, Dong H. [Ying Yong Zhao Xiang Shou Ji Dui Mian Bu Cuo Chuang Yan Zhong Xing Jin Xing Yuan Cheng Fen Ji De Ke Xing Xing]. Zheng Zhou Da Xue Yi Xue Bao 2009(6):1229-1232. Wang ZX, Zhang M, Wu J, Sun L, Jiang T, Song C. [Yi Zhong Xin De Ji Shi Xing Tu Xiang Fa Shan Shi Diao Cha Ji Shu He Xiao Guo Ping Jia]. Ying Yang Xue Bao 2014;3:288-295. Dai MQ, Lou Q, Zhang Y. [Wu Xian Tong Xun Duan Xin Jiao Yu Zai Tang Niao Bing Huan Zhe Zi Wo Guan Li Zhong De Ying Yong]. Zhong Hua Hu Li Za Zhi 2010;3:225-227. Shi HJ, Yu C, Zhang S, Zhang Y, An A, Tan H, et al. [Qing Shao Nian Jie Yan Xin Yi Tong Xin Ji SHu Gan Yu Shi Shi Fang An Ke Xing Xing Fen Xi]. Zhong Guo Xue Xiao Wei Sheng 2010;12:1434-1432. Ni YX, Pan J, Xing Z, Bi X, Dong Y, Cong X. [Duan Xin Qun Fa Ping Tai Fu Zhu Yun Fu Xue Xiao Jian Kang Jiao Yu De Xiao Guo Guan Cha]. Zhong Hua Hu Li Za Zhi 2013;12:1093-1095. Liu YS, Li Y, Wu Y. [Duan Xin Jiao Yu Gai Shan Ji Xing Guan Mai Zong He Zheng Huan Zhe Jie Ru Shu Hou Fu Yao Yi Cong Xing De Xiao Guo Yan Jiu]. Zhong Hua Hu Li Za Zhi 2015;06:660-665. Wei N, Chen W, Zhang X, Mo Y, Lei H, Wang J, et al. [Duan Xin Ping Tai Jiao Yu Zai Ti Gao Man Xing Shen Zang Huan Zhe Fu Yao Yi Cong Xing Zhong De Ying Yong Yan Jiu]. Zhong Guo Quan Ke Yi Xue 2013;25:2287-2289. Qu JL, Zhang T, Song J, Fang H. [Chu Yuan Hou Jing Shen Fen Lie Zheng Huan Zhe Fu Yao Yi Cong Xing Dian Hua He Duan Xin Gan Yu De Yi Nian Sui Fang]. Zhong Guo Xin Li Wei Sheng Za Zhi 2015;09:656-661. Zhang J, Wu Y, Yuan M, Yin Y, Wang W, Zhang L, et al. [Qi Xiang Huan Jing Yu Jing Yu Bao Ji Shu Dui Xiao Chuan Er Tong Sheng Ming Zhi Liang Gan Yu De Yan Jiu]. Zhong Guo Shi Yong Er Ke Za Zhi 2013;03:189-194. Fang X, Shen G, Wu L, Chen Y, Xu W, Hu S. [An Hui Zhong Bu Zhi Ye Ren Qun Gao Xue Ya Jiao Yu Gan Yu Xiao Guo Ping Jia]. Zhong Hua Gao Xue Ya Za Zhi 2010;10:965-969. Li LX, Wu K, Huang L, Xu H, Luo M. [Duan Xin Jiao Yu Dui Yun Fu Shan Shi Ji Ti Li Huo Dong Xing Wei De Ying Xiang]. Guang Dong Yi Xue 2014;24:3927-3929. Qing XY, Shao Q, Nie J, Wang L, Ma H, Hu Y. [Duan Xin Jiao Yu Dui Xue Ye Tou Xi Qi Jian Huan Zhe Ti Zhi Liang De Ying Xiang]. Zhong Hua Hu Li Za Zhi 2012;04:311-313. Xie B, Ju C, Sun Z, Han J, Liu L. [Tang Niao Bing Zi Wo Guan Li Pei Xun Zhi Dao Wang Luo Dui Er Xing Tang Niao Bing Huan Zhe Zi Wo Xiao Neng De Ying Xiang Yan Jiu]. Zhong Guo Quan Ke Yi Xue 2012;31:3616-3612. Zhao M, Yang L, Chen Q, Zhai S. [Tang Niao Bing Huan Zhe Ge Ti Hua Shou Ji Duan Xin Yao Xue Fu Wu De Xiao Guo Yan Jiu]. Zhong Guo Yao Fang 2010;42:4020-4023. Chen J, Zhang S, Wang X. [Bei Jing Shi Mou She Qu Si Ge Yue Nei Mu Ru Wei Yang Gan Yu Yan Jiu]. Zhong Guo Er Tong Bao Jian Za Zhi 2014;05:469-466. Chen J, Li Y, Mou Z, He S, Peng L. [Huan Jing Yu Jiang Kang Duan Xin Yu Jing Dui Er Tong Bian Ying Xing Bi Yan Liao Xiao De Ying Xiang]. Lin Chuang Er Bi Yan Hou Tou Jing Wai Ke Za Zhi 2015;03:218-214. He JEA. [Zhi Neng Shou Ji Jian Kang Guang Li Ruan Jian Dui She Qu Ren Qun Jian Kang Shui Ping He Sheng Huo Zhi Liang De Gan Yu Xiao Guo Yan Jiu]. Zhong Guo Quan Ke Yi Xue 2015;19:2333-2336. Chen LEA. [Shou Ji Gan Yu Mo Shi Zai Liu Dong Ren Kou Xue Fang Gong Zuo Zhong De Zuo Yong]. Xian Dai Yu Fang Yi Xue 2013;09:1754-1756. Zhou REA. [Guang Xi Wu Yu Zhen Yun Fu Yu Fang Ai Zi Bing Mu Ying Chuan Bo Jian Kang Jiao Yu Mo Shi Yan Jiu Yu Shi Jian]. Zhong Guo Fu You Bao Jian 2015;24:4103-4107. ©Maoyi Tian, Jing Zhang, Rong Luo, Shi Chen, Djordje Petrovic, Julie Redfern, Dong Roman Xu, Anushka Patel. Originally published in JMIR Mhealth and Uhealth (http://mhealth.jmir.org), 16.03.2017.